It was once said that it was difficult to grow eremophilas in Sydney. The Sydney Branch of the Eremophila Study Group has been growing this genus for quite a number of years. We have seen these eremophilas magnificently come through five years of drought and on occasions, extreme weather conditions. We wondered how, with very little moisture in the ground these eremophilas continued to grow and bloom. Throughout autumn and early winter there always were species in flower. Then from mid-winter to late summer the gardens came alive as species after species burst into full bloom. As the drought continued some of the Eremophila species started showing signs of stress - but they survived. One unanswered question was - what will happen when the weather pattern changes? Well change it did: the July - August 2007 period saw 300 mm and more of rain dumped on Sydney and its suburbs. Again our eremophilas responded magnificently. But as the rain continued throughout the summer of 2007 and the winter of 2008 some losses did occur, but the majority survived. To be honest, we expected a big loss in plants, but it seems that eremophilas are more resilient than we expected them to be. From our experience in growing eremophilas in the Sydney region we believe that quite a number of Eremophila species can be grown successfully here. We are mindful that everyone has different soil and growing conditions so it may be still a case of "try and see". From the newsletter of ASGAP's Eremophila Study Group, October 2012. 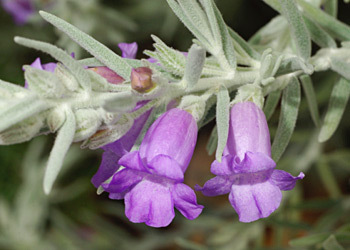 For more information on Eremophila, see ANPSA's Eremophila and Relatives section of the website.